For Gaussian beams effective focal spot area it is determined at I0/e level of maximal intensity by CCDs and converted into the units of square centimeters. In case when I0/e² or I0/2 (FWHM) criteria is used additional factors have to be taken into account that are often forgotten. See figure for details. Peak fluence is by far one of the most important parameter that requires accurate characterization. 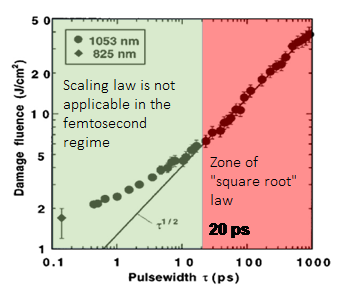 For pulse durations <20 ps this scaling law LIDT is not applicable. In this case LIDT of optics should be tested individually. Contact LIDARIS experts for more details. Within long-pulse regime (>20 ps up to ms) transfer of electron kinetic energy to the lattice and diffusion takes place during the laser pulse. The longer the pulse duration, the more energy the optic can handle. For short-pulse (< 20 ps) pulse duration law is no longer applicable. Optics should be tested individually. Also, for pulse durations in the range of ms, the CW LIDT must be checked. Pulse width dependence of threshold damage fluence for fused silica. This graph was obtained from . B. C. Stuart et al., Phys. Rev. B, 53, 1749 (1996). 1. In physics, the wavelength λ of the sinusoidal wave is the spatial period of the wave - the distance over which the wave's shape repeats. where h is the Planck constant, c is the speed of light. In case when the same lens is used for focusing of Gaussian beams at different wavelengths (in example laser harmonics) it is practical to know how much the beam diameter would change because of the wavelength. This calculator enables easy scaling of Gaussian beam focused by an aberration free lens with wavelength used in your measurement. Enter required data into the boxes to calculate spot size changes. λ1 - actual wavelength: known wavelength of actual spot size in focus. λ2 - desired wavelength: other wavelength that you desire to use with the same lens. Dwaist1 - actual spot size in focus: spot size in focus at defined level of intensity. 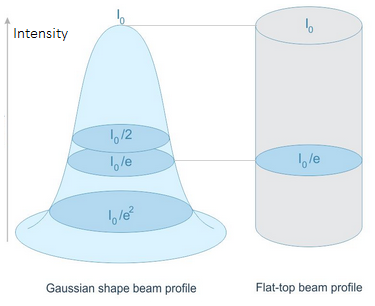 This calculator evaluates spot size of Gaussian beam focused by an aberration free lens. Enter required data into the boxes to calculate focused spot size diameter and Rayleigh range for your measurement. You might get to know required parameters by fallowing below provided tutorial. 1. Considering an optical system in air lens focal length is the distance over which initially collimated rays are brought to a focus. It is basic description of the lens and usually provided by the production. However, you should note that focus length of the same lens differs for different wavelengths. 2. In physics, the wavelength λ of the sinusoidal wave is the spatial period of the wave - the distance over which the wave's shape repeats. 3. M² is the beam quality factor. It provides a simple means for accurately calculating the most commonly required parameters of real world laser beams, namely, divergence angle, propagation characteristics over a distance, and the size of focused spots. 4. 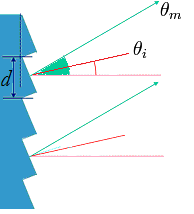 Spot size diameter (marked as DL in the figure) is the diameter of the beam spot size at the I0/e² level of intensity on the entrance of the lens. Higher order diffraction maxima m can be either positive or negative, thus resulting in diffracted light on both sides of the zero order beam. We hope you have enjoyed Lidaris Calc. It was created in order to save your valuable time and prevent laser damage of your laser optics by considering laser fluence. 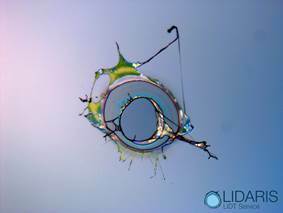 In case you are still facing issues related to Laser-Induced Damage Threshold (LIDT) phenomena get one free consultancy from Lidaris experts.